Fresh on the heels of its F-150 XLT and Lariat models' release, Ford announced today that it will debut its 2013 FX4 trim level at the NASCAR Sprint Cup Race at the Michigan International Speedway Sunday. 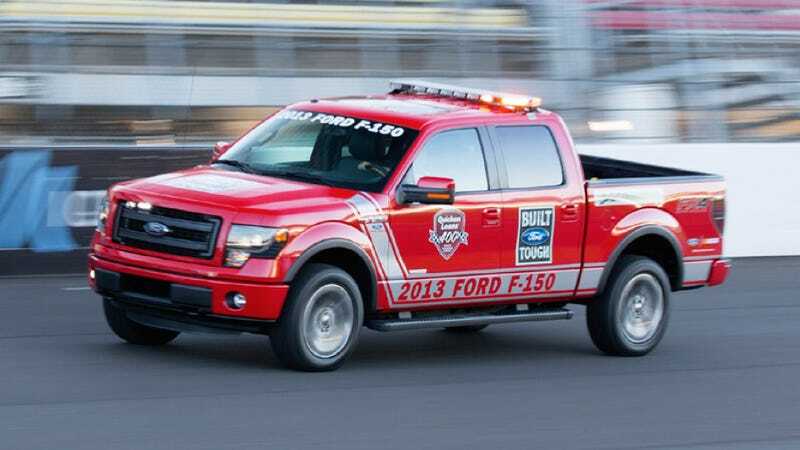 It will be the race's official pace truck. Like all the other 2013 F-150 models, the 365 hp 3.5-liter EcoBoost V6-equipped FX4 will have the beefy new grille, and this one, at least, will feature HID projector headlamps. Ford said that like the SVT Raptor, FX4s will come stock with hill descent control and SYNC with MyFord, Ford's 4.2-inch screen controlled infotainment system. We're not sure what all that will do for the pace truck on an oval track, but it's cool nonetheless. For a little more money, of course, customers can upgrade to SYNC with MyFord Touch, which includes a full color 8-inch LCD screen. That package comes with more bells an whistles, of course, including USB ports, an SD card reader, and audio/video input jacks. That's right, it turns the truck into a laptop. It sounds like the blue oval folks are especially proud of the new grill, though. They used the word bold to describe it. Personally, I'd opt for chunky, or meaty (or beefy, as I did earlier). But that might confuse customers into thinking the truck comes with a free palette of Campbell's Soup. Ford finally owns its own logo again. Why was it gone, and what did it take to get it back?